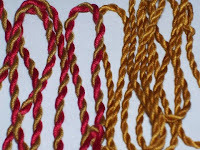 I posted a new Instructable today, showing how to make custom cording for craft, costuming, and home decorating projects. It's made from embroidery thread which is cheap, readily available, and comes in an absolute sea of colors. The nice thing about making it yourself it that it can be the precise color, thickness, and length you need!